This instrument is lavishly embellished with expensive materials, and it would most likely have been made for a rich amateur rather than a professional musician. 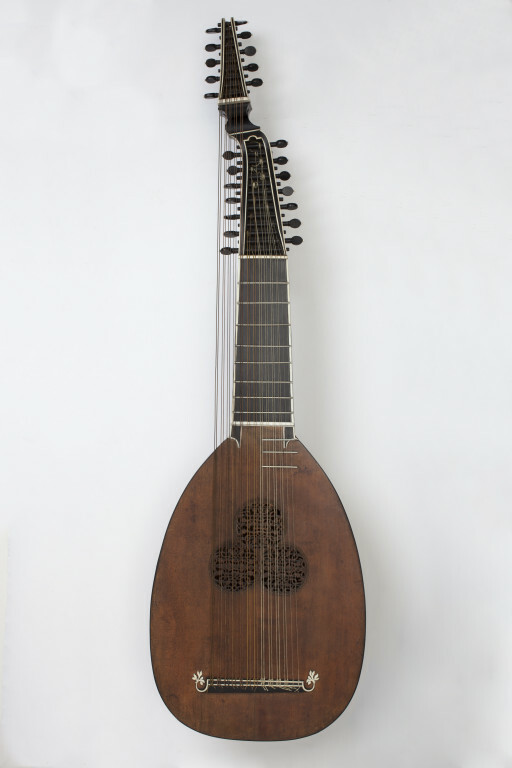 By about 1700 the therobo was similar to the Baroque lute--both were most commonly strung with 13 courses and tuned the same way. 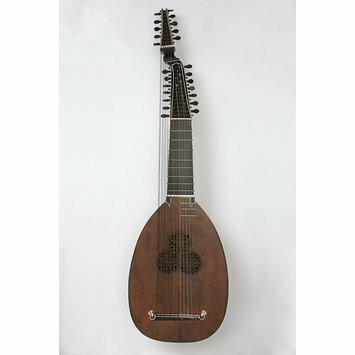 However, the pegbox of the theorbo is nearly alligned with the neck, whereas that of the lute is bent sharply back. This instrument was most often used for accompaniment to singing during the 18th century, and variants continued to be made in Germany and Sweden up until about 1830. This theorbo is attributed to Michael Rauche of Chandos Street, London, who was active during the 1760s and 1770s. He is thought to have been German, and it has recently been suggested that he was more likely to have been a retailer than a maker. Body of twenty-three ivory ribs with ebony stringing between. Belly of pine with inset triple rose carved in wood. The neck is veneered with ebony, the lower section bearing the maker's name, the upper two sections having panels containing musical trophies and flowers, all executed in ivory applied in relief. Fingerboard veneered with ebony, with nine ivory frets. Also three frets set in the belly. The pegboxes are of ebony trimmed with ivory, the main with fourteen pegs, the upper with ten for five double courses. Ivory ribs with ebony stringing, ebony venerred neck and fingerboard. dated 1770, is at the Ashmolean Museum, Oxford. and S. L. Weiss and amateurs like the painter Thomas Gainsborough.